Veneris, 11 die Decembris; 3° Gulielmi et Mariæ. 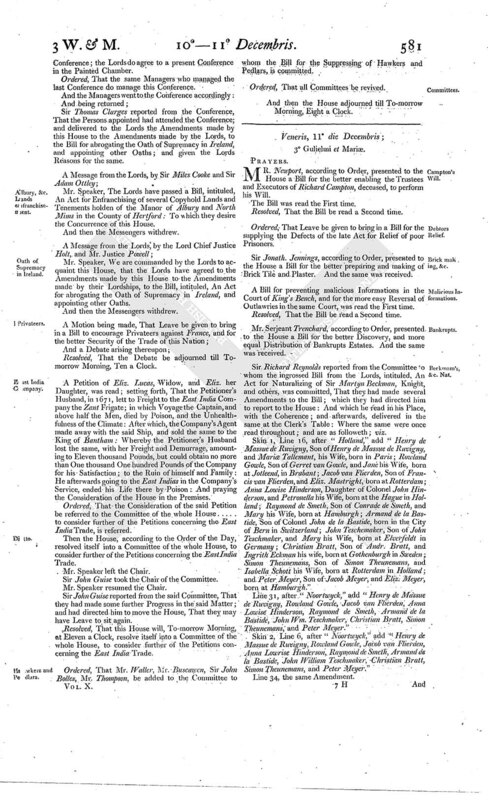 MR. Newport, according to Order, presented to the House a Bill for the better enabling the Trustees and Executors of Richard Campton, deceased, to perform his Will. Ordered, That Leave be given to bring in a Bill for the supplying the Defects of the late Act for Relief of poor Prisoners. Sir Jonath. Jennings, according to Order, presented to the House a Bill for the better preparing and making of Brick Tile and Plaster. And the same was received. A Bill for preventing malicious Informations in the Court of King's Bench, and for the more easy Reversal of Outlawries in the same Court, was read the First time. Mr. Serjeant Trenchard, according to Order, presented to the House a Bill for the better Discovery, and more equal Distribution of Bankrupts Estates. And the same was received. Sir Richard Reynolds reported from the Committee to whom the ingrossed Bill from the Lords, intituled, An Act for Naturalizing of Sir Martyn Beckman, Knight, and others, was committed, That they had made several Amendments to the Bill; which they had directed him to report to the House: And which he read in his Place, with the Coherence; and afterwards, delivered in the same at the Clerk's Table: Where the same were once read throughout; and are as followeth; viz. Skin 1, Line 16, after "Holland," add "Henry de Massue de Ruvigny, Son of Henry de Massue de Ruvigny, and Mariæ Tallemant, his Wife, born in Paris; Rowland Gowle, Son of Gerret van Gowle, and Jane his Wife, born at Jotleend, in Brabant; Jacob van Flierden, Son of Francis van Flierden, and Eliz. Mastright, born at Rotterdam; Anna Lowise Hinderson, Daughter of Colonel John Hinderson, and Petronella his Wife, born at the Hague in Holland; Raymond de Smeth, Son of Conrade de Smeth, and Mary his Wife, born at Hamburgh; Armand de la Bastide, Son of Colonel John de la Bastide, born in the City of Bern in Switzerland; John Teschemaker, Son of John Teschmaker, and Mary his Wife, born at Elverfeldt in Germany; Christian Bratt, Son of Andr. Bratt, and Ingrith Eckman his wife, born at Gothenburgh in Sweden; Simon Theunemans, Son of Simon Theunemans, and Isabella Schott his Wife, born at Rotterdam in Holland; and Peter Meyer, Son of Jacob Meyer, and Eliz. Meyer, born at Hamburgh." Line 31, after "Noortwyck," add "Henry de Massue de Ruvigny, Rowland Gowle, Jacob van Flierden, Anna Lowise Hinderson, Raymond de Smeth, Armand de la Bastide, John Wm. Teschmaker, Christian Bratt, Simon Theunemans, and Peter Meyer." Skin 2, Line 6, after "Noortwyck," add "Henry de Massue de Ruvigny, Rowland Gowle, Jacob van Flierden, Anna Lowrise Hinderson, Raymond de Smeth, Armand de la Bastide, John William Teschmaker, Christian Bratt, Simon Theunemans, and Peter Meyer." Line 34, the same Amendment. And the said Amendments being severally read a Second time, one by one, were, upon the Question put thereupon, agreed to by the House. Resolved, That the Bill do pass; And that the Title be agreed to. Ordered, That Sir Richard Reynolds do carry the Bill to the Lords; and acquaint them, That this House hath agreed to the Bill, with the said Amendments; and desire their Concurrence to the said Amendments. Then the House proceeded, according to the Order of the Day, to take into Consideration the Amendments made by the Lords to the Bill, intituled, An Act for the Regulation of Tryals, in Cases of Treason. And the said Amendments were once read throughout; and are as followeth; viz. In the Title, after "Treason," add "Tryals in Cases of Treason, and Misprision of Treason." Skin 1, Line 2, after "Prosecution," read "Persons prosecuted." Line 9, instead of "for Remedy whereof," read "in order thereunto." Line 11, for "indicted," read "prosecuted." Line 40, after "Witnesses," insert, "who shall then be." Skin 2, Line 1, leave out "or otherwise." Line 2, after "Case," leave out to "the," in Line 5; and insert "upon the Arraignment of any Person or Persons so accused or indicted, such Person or Persons shall desire Counsel." Line 6, after "tried," add "or some Judge of that Court." Line 8, leave out "such or other Counsel." Line 9, after "Persons," add "such and so many Counsel, not exceeding Three, as the Person or Persons shall desire, Ten Days at least, before such Person or Persons shall be tried." Line 10, for "Times," read "Hours." Line 23, after "same," insert "or shall stand mute, or refuse to plead, or peremptorily challenge above the Number of Thirty-five of the Jury." 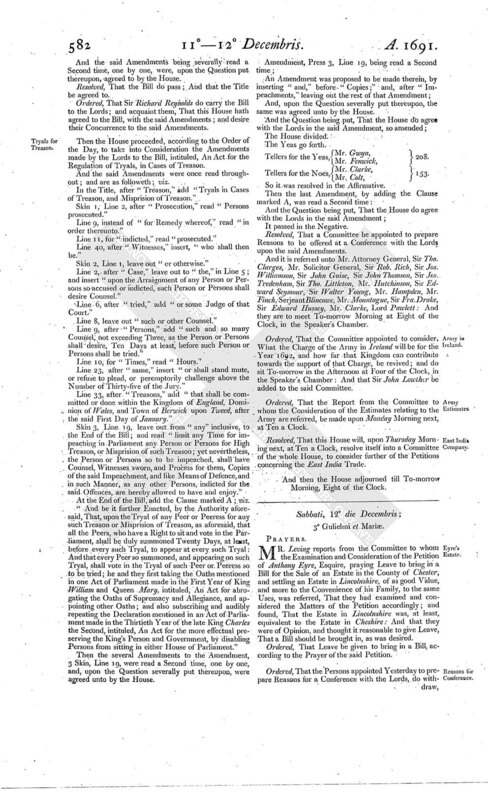 Line 33, after "Treasons," add "that shall be committed or done within the Kingdom of England, Dominion of Wales, and Town of Berwick upon Tweed, after the said First Day of January." Skin 3, Line 19, leave out from "any" inclusive, to the End of the Bill; and read "limit any Time for impeaching in Parliament any Person or Persons for High Treason, or Misprision of such Treason; yet nevertheless, the Person or Persons so to be impeached, shall have Counsel, Witnesses sworn, and Process for them, Copies of the said Impeachment, and like Means of Defence, and in such Manner, as any other Persons, indicted for the said Offences, are hereby allowed to have and enjoy." At the End of the Bill, add the Clause marked A; viz. "And be it further Enacted, by the Authority aforesaid, That, upon the Tryal of any Peer or Peeress for any such Treason or Misprision of Treason, as aforesaid, that all the Peers, who have a Right to sit and vote in the Parliament, shall be duly summoned Twenty Days, at least, before every such Tryal, to appear at every such Tryal: And that every Peer so summoned, and appearing on such Tryal, shall vote in the Tryal of such Peer or Peeress so to be tried; he and they first taking the Oaths mentioned in one Act of Parliament made in the First Year of King William and Queen Mary, intituled, An Act for abrogating the Oaths of Supremacy and Allegiance, and appointing other Oaths; and also subscribing and audibly repeating the Declaration mentioned in an Act of Parliament made in the Thirtieth Year of the late King Charles the Second, intituled, An Act for the more effectual preserving the King's Person and Government, by disabling Persons from sitting in either House of Parliament." Then the several Amendments to the Amendment, 3 Skin, Line 19, were read a Second time, one by one, and, upon the Question severally put thereupon, were agreed unto by the House. And, upon the Question severally put thereupon, the same was agreed unto by the House. Tellers for the Yeas, Mr. Gwyn, 208. Tellers for the Noes, Mr. Clarke, 153. Resolved, That a Committee be appointed to prepare Reasons to be offered at a Conference with the Lords upon the said Amendments. And it is referred unto Mr. Attorney General, Sir Tho. Clarges, Mr. Solicitor General, Sir Rob. Rich, Sir Jos. Williamson, Sir John Guise, Sir John Thomson, Sir Jos. Tredenham, Sir Tho. Littleton, Mr. Hutchinson, Sir Edward Seymour, Sir Walter Young, Mr. Hampden, Mr. Finch, Serjeant Blincowe, Mr. Mountague, Sir Fra. Drake, Sir Edward Hussey, Mr. Clarke, Lord Pawlett: And they are to meet To-morrow Morning at Eight of the Clock, in the Speaker's Chamber. Ordered, That the Committee appointed to consider, What the Charge of the Army in Ireland will be for the Year 1692, and how far that Kingdom can contribute towards the support of that Charge, be revived; and do sit To-morrow in the Afternoon at Four of the Clock, in the Speaker's Chamber: And that Sir John Lowther be added to the said Committee. Ordered, That the Report from the Committee to whom the Consideration of the Estimates relating to the Army are referred, be made upon Monday Morning next, at Ten a Clock. Resolved, That this House will, upon Thursday Morning next, at Ten a Clock, resolve itself into a Committee of the whole House, to consider further of the Petitions concerning the East India Trade.